The court is expected to deliver its decision on issuing an arrest warrant for South Gyeongsang Province Gov. Kim Kyoung-soo later on Friday or early Saturday in connection with an online opinion-rigging scandal. Kim, who is suspected of orchestrating opinion rigging in favor of then-presidential front-runner Moon Jae-in, was transferred to a detention facility in the southwestern suburb of Seoul, after attending a hearing on his arrest warrant that lasted about two hours. 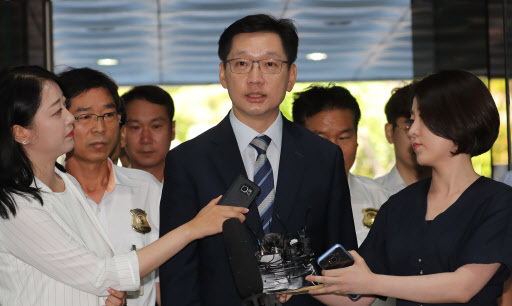 “I will explain everything fully and faithfully at the court as I did (during the probe),” the governor told reporters upon his arrival at the Seoul Central District Court. Special counsel Huh Ik-bum requested an arrest warrant for Gov. Kim, Moon’s close associate, on Wednesday on charges of obstruction of business, viewing him as an accomplice of the power blogger Kim Dong-won, known as Druking. The blogger, already arrested, is standing trial over allegations that he fabricated some 1.1 million comments on some 75,000 news articles on the internet portal Naver between December 2017 and February 2018 to sway public opinion in favor of the then-main opposition Democratic Party and its presidential hopeful Moon. Gov. Kim is suspected of orchestrating or condoning the blogger’s use of illegal automated software to manipulate comments on online news articles. The special counsel suspects that Druking introduced the computer program King Crab to Gov. Kim when he visited Druking’s team in Paju, Gyeonggi Province, in November 2016. Gov. Kim approved of the use of the automated software and started to send URLs of news articles to Druking for the blogger to fabricate comments in favor of the party and Moon, according to the investigators. Gov. Kim admitted that he had visited the team’s headquarters in Paju, but flatly denied other allegations. Gov. Kim insists he was not aware of Druking’s suspected opinion rigging or the computer program. If the court issues the arrest warrant, it will be a major blow for the governor, who won the position in June despite the scandal and is now considered one of the presidential hopefuls. It could also raise questions over the integrity of the Moon administration.